How to Avoid Crying at Work [Part 2 of 3] | Blog | Ms. JD | Determined to Rise. Previously I described four ways to avoid crying at work: focusing on your breathing, taking a step back, cauterizing your tear ducts, and distracting yourself with pain. Prepare an agenda for your meeting, a physical piece of paper that you can set on the desk in front of you or hold in your hands. If that doesn't fit the situation, you could carry a legal pad or your PDA to take notes. An HR specialist from Dalhousie University advises, "If you’re an easily-teary type (and everybody is teary sometimes) simply have a list of items you plan to follow and do it. When you feel a pull in your throat, look down at your list of items and go onto the next one." I call the agenda, the notepad, and the PDA "props" for a reason: they can prop you up. Lean on them to get through tense moments. Look down with the pretense of jotting notes; read from them if you find yourself choked up and momentarily at a loss for words. It works. 6. Let yourself get angry. "[G]etting emotional" in a professional setting ... hasn't happened to me in at least 10 years. But when it did, it was never sadness. It was anger. I'd be angry at something, but not comfortable getting angry, and that made me embarrassed, and that made me more angry... and the whole cycle just got worse. Tears, runny nose, blushing, red spots on my chest and neck. I found that allowing myself to get angry helped A LOT. When I lost my fear and embarrassment about my own anger, I was able to take a deep breath, speak slowly and clearly, and maintain my composure. Ask yourself: is your tendency toward tears in a professional setting coming from a discomfort with your own anger? Girls are not often socialized to express anger or engage in conflict. For example, my mom always told me, "Keep a smile on your face no matter what." To this day, whether I am at home half-asleep or awake in a darkened movie theater, I have at least a half-smile. The point is, our childhood habits are hard to unlearn. But we can teach ourselves new skills as adults. Allow yourself to get angry. More comfort with conflict may mean fewer tears. It worked for Vera! The general idea of behavioral therapy is to pay more attention to problem thoughts and behaviors, so that you can plan and habituate better ways to deal with them. If you're in CBT, for example, you'll probably be asked to keep a journal. Then if you notice a behavior pattern--say, you always tear up before meetings with your boss--you would brainstorm and practice implementing better coping mechanisms. If drinking tea or listening to classical music calms you down, you might get in the habit of brewing a cup or popping in your headphones 15 minutes before the start of predictably tough meetings. Another part of CBT is to examine your emotions closely: why is it that confrontations make you feel like crying? There could be different reasons--you're afraid of losing your job, or you hate confrontation in general, or a particular co-worker intimidates you. Identifying why you feel like crying will help you figure out a better way to think about the situation. 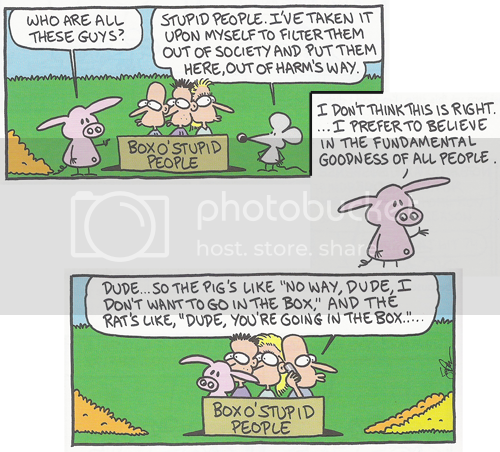 Note, dear readers, that Stephen Pastis--who draws the comic Pearls Before Swine--used to be a lawyer. Humor is clearly his coping mechanism of choice! You control your emotional responses. You are empowered by that control. The more you can reinforce this message to yourself, the more successfully you may manage your responses to stressful situations. In a nutshell, that's what CBT teaches. There's a lot more to it, of course; if you are interested, I recommend this book by the founder of DBT. It's kind of a dense read, though, so you might do better to seek out a qualified provider for individual or group therapy. 8. Do it for somebody else. Peg once asked me for advice about securing a raise at her firm. Like many women in law, she expressed discomfort and a reluctance to raise the issue. As we discussed her dilemma with fellow law students, the solution became crystal clear. It was like a light bulb burst on above Peg's head. Her eyes absolutely lit up. The solution? She thought of her kids. Reframing a personal confrontation as a confrontation on behalf of someone else made it easier for Peg to enter the stressful situation of a salary discussion. While she felt reluctant to broach the subject for herself, we did a little math about how a small raise now would mean a lot more money accruing later in her children's college funds. If you're a mom, you probably know what I'm talking about. Moms are fierce for their kids. Even when women feel like they don't deserve stuff for themselves, they'll fight tooth and nail for their families. I don't even have kids yet, and this trick works for me. I just think about the children that I want to get myself in a position to adequately support, and that's enough. If you don't have or want kids, think of your partner, your parents, or people to whom you're not even related. Remember why you want to succeed in your job, the good you can do for others. Getting past ourselves and our own insecurities can get us past a lot of tears. This is Part 2 of a series. For tips #1-4 and #9-12, read Part 1 and Part 3.